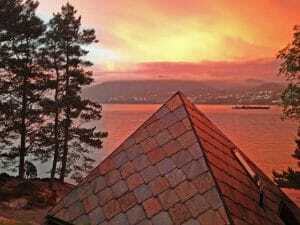 Ask Retreat Centre is situated near the village of Ask on the east side of the island of Askøy, approx. 20 km north of Bergen, the main capital of western Norway. The retreat centre includes the main house called The Log House with kitchen, living / dining room, toilet, shower and 3 rooms with 2, 2 and 1 beds. Besides you will find 3 Cabins: The Timber Cabin, a handmade cabin of timber with kitchen, toilet and shower and 3 beds (one of which is double), The Alcove, a smaller cabin with 1 double and 1 single room and a shared toilet and the Boat house by the sea, a 2 bed room with toilet and shower. The new Seaview Apartment accommodates 3 students in one single and one double room. The 50 sq.m. Yoga Room is situated in the basement of the Log House. 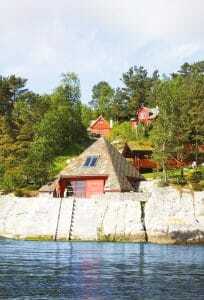 The meditation hall is 36 sq.m in the Pyramid by the sea with a big sauna in the basement. 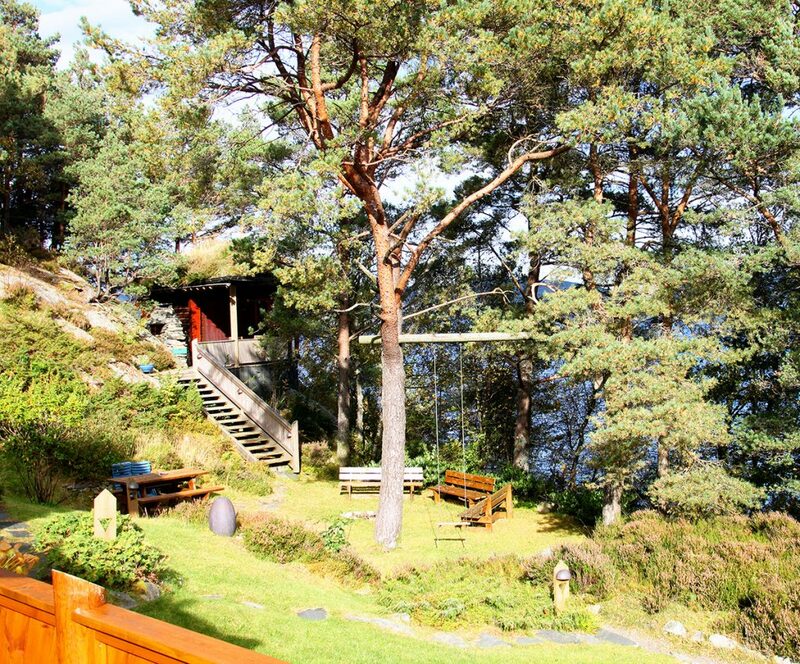 The retreat centre is situated undisturbed by the sea with a fantastic view towards Bergen. There are fine walking possibilities in the surrounding hills. We allocate the rooms according to the group’s composition and the participants’ gender and age. If you wish to reserve a single room or a double room together with a partner, it should be specified when you enroll. Bring beddings (covers for duvet and pillow), casual clothes, including bathing costume/trunks, water proofs and solid footwear. Bring comfortable loose clothes for the classes. Beddings and towels can also be hired for NOK 100. The courses are international. The language is English, supplemented with Norwegian/Danish. If there is something you are in doubt about, don’t hesitate to contact us beforehand. When on the course, please tell the teacher if there is anything you do not understand due to the language. We serve vegetarian food, based mostly on organically grown vegetables. Throughout the course we avoid stimulants such as chocolate, black tea and alcohol. Coffee will be available on weekend courses and 5-days courses, but on the 10-days Summer Retreat (where we do the Intestinal cleansing) it will not. You don’t have to be a vegetarian to get something out of yoga, but it creates an optimal state of body and mind when doing intensive yoga and meditation. In addition to other benefits, scientists have found that this diet considerably helps to decrease the content of harmful cholesterol in the blood. Regardless of what you eat when you return home, you will benefit from the yoga you have learned here. Note: On the 10-days Summer retreat we do the intestinal cleansing. For ten days after that we follow a diet without coffee, black tea, milk, sugar, spices, raw vegetables and fruit. The food is healthy and nutritious, selected to make up a balanced diet. 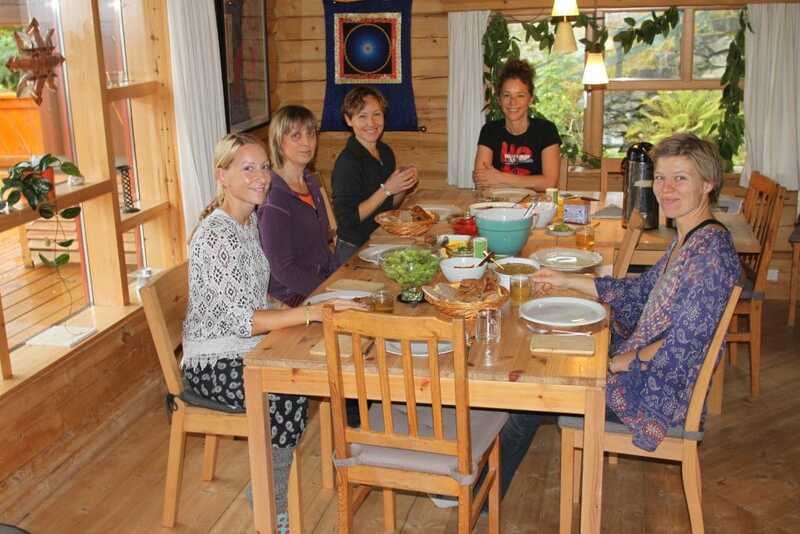 On all other retreats you will also be served food with some spices, raw vegetables and fruit. Ask Retreat Centre is situated near the village of Ask approx. 20 km north of Bergen and the international airport Flesland. Read more about how to travel to Ask Retreat Centre. All retreats start in the evening on the day of arrival. The Center is open from 5 pm, but please come no later than 7 pm. Important instructions are given in the final session on the last day. When you enroll please make sure that you can stay the whole period, without interruptions. We conduct, not just a course, but a retreat in the true sense of the word. You are able to take a break from the usual influences and impressions. Thus your stay here is more of a real holiday for your body and mind than many holidays where tourists gather. Of course this doesn’t mean that there is anything wrong with daily life and its influences, but it is fruitful to really take a break to gain perspective – and some peace to do what you have come for. You are required to attend all classes at the scheduled times. Do not use your car at any time. Please observe the period of silence (if that is part of the retreat). Only eat the food served by the school and only in the dining hall. Do not smoke on the school’s premises, neither indoors nor outdoors. If you must smoke, then take a walk alone and do not influence others who might want to stop smoking, neither by smell nor by sight. Do not use products containing perfume on the skin or for the hair. The smell can be distracting especially in the yoga hall and affect allergy sufferers. We sell affordable alternatives if you need them. To enhance your course experience, please tell relatives and friends that you only want to receive essential correspondence, that it is not possible to phone or visit you dur­ing the course ‑ nor will you contact them except during an emergency. If an emergency arise in your family they can contact you through phoning the retreat centre at +47 56 15 15 00. Leave your Cell Phone, iPad, computer and anything similar at home or turn it off upon arrival. The school reserves the right to dismiss any student without reimbursement. This should be seen in the context of these the conditions. Reserve a place in good time. Courses are often filled up quickly. Enrolment is done in our web shop which accept secure payment with PayPal, VISA and MASTER credit card. Your enrolment is only valid when your payment / deposit has been registered on our account. Please pay the balance of your fees no later than two weeks before the start of the course. And please bring your receipt. The fees include accommodation and meals. Extra costs (only on the 10-days retreat) are a Nose Cleansing Pot and a string of beads (Mala) for meditation. If you already have such, bring them with you. Otherwise you can buy them at Ask. Should you leave the course at any stage, no fees are refundable, regardless of your reasons for departure. These conditions are to ensure that you will be on the retreat with people who have also made a commitment to participate fully and absorb what we teach. …to come with you on the course, not even your partner, unless they themselves are completely motivated to participate. Come for your own sake. Come because you want to discover and work with yourself.